TJP poultry inlet feature patented counterbalance louvers that open from the top instead of the bottom. TJP Inlet air is directed towards the peak of the chicken house, utilizing the heat collected at the poultry house peak. 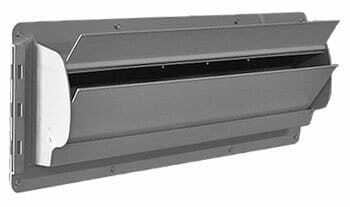 The use of TJP1255, TJP1265, and TJP1275 wall air Inlets eliminate curtain and baffle pulley and cable management required with traditional winter inlet systems. Use of a wind deflector is suggested.